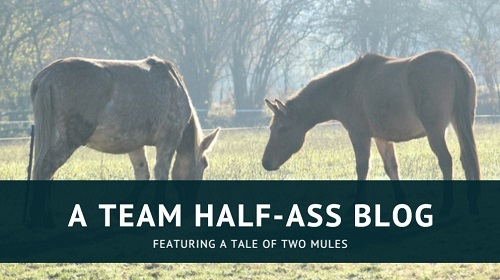 The mule has seemed a little bit subdued since the incident on Monday. When I went back up to the stables that evening, he was incredibly gentle and cuddly; very clingy and attention-seeking, but not in his usual brash, bold way. I laughed at first because Ben and I were just hanging out in the field, sharing groomies with our respective equines, and every time I tried to take a photo of Ben with the horses, Marty would either step forward and block the camera or he’d move his head and block me from seeing them. I got a very strong sense that he was trying to tell or ask me something, or that there was something specific that he wanted from me; when I put the camera away and waited to see if he’d ask for more scratchies, he pulled his frustration face: ears back (but not pinned) and muzzle jerked towards me. He hasn’t done this to me for a while now and, unlike previous faces, this one seemed a lot ‘quieter’; he wasn’t demanding, he was almost pleading. But I couldn’t decipher his request at all. The next morning, he didn’t bray to me when I stopped on the other side of the lane to see to a friend’s horses. I go there first thing every morning, and every morning Marty calls to me when I arrive; I assume that he can either see me through a gap in the trees, or he just hears the padlock go on the gate and knows that it’s me. When I went through the gateway to our yard and glanced over at our field, Iris and Cash were walking together and Marty was standing in the far corner by himself. I went straight round to the hay shed, and was surprised when I came back to find that the horses were waiting by the gate but Marty was still in his corner. When he saw me he came over, and I went out to meet him as I was worried by his behaviour. But he seemed fine, wanted scratchies, and tucked into his hay. Tuesday’s are usually his day off, but given the difficulties we’ve had lately with catching and his recent scare, I wanted to just put his halter on and off to make sure that was still a thing I could do. Interestingly, as I entered the field both the horses walked across in front of me and swept the mule up as they went; they weren’t exactly herding him, but they were definitely moving him away from me. This is not normal behaviour for them. I waited, and while the horses carried on walking, Marty did an abrupt turn, pushed his way between them, and came up to me. He was a little hesitant to be haltered; his neck braced and he began to walk backwards, but I put a hand on his shoulder and he stopped. I was then able to halter him, although I had to do so very carefully. I took him up to the yard to groom him and give him an apple (a special treat), and while I was there I pulled a thorn out of his foot. It was very small and left no visible hole, but I thought I ought to clean his sole and spray it with antiseptic just to be on the safe side. Considering the palaver I had trying to get fly spray on him last year, I was very pleased when he stood perfectly to have the antiseptic sprayed on! This morning he called to me when I stopped off at the other field, and as I was heading up to our yard (on my bike) I had to pull over to let a car pass. 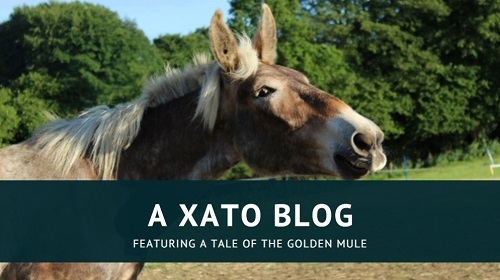 I waited just below their balcony, which is a gap in the hedge that allows them to look down on the road, and the mule was already standing there. He began to give silent whickers when he saw me, only he was silent whickering so hard that his entire body quivered with each flutter of his nostrils. It was pretty damn cute. I went into the field and did my usual pre-hay routine: greet the mule, give scratchies to the mule, hug the mule, give the mule his treat, hay everyone. Only this time, as I put my arm over his neck to hug him, he panicked and pulled away. This was quite weird and so I spent a little time building up his tolerance until I was able to put an arm over his neck and rub on him, but not actually hug him. I assumed it was because I was wearing a big rustly jacket and he was damp from rain and any other number of sensory things he objects to. This evening, he was in his corner again; backed right up into it and resting a hindleg, while the horses hung out together on the other side of the field. He came out when I arrived at the gate and there was nothing obviously amiss with him. The horses didn’t block me from catching him this time, but he was still anxious about it; which is a shame, as he’s been perfect for the past couple of weeks. I get the impression that he may start his spinning away soon. I ended up taking him for a short walk down into the village and back. He was very good – not hesitation to leave, no planting in his usual places – but I felt like he was carrying a lot of anxiety. Not in the obvious way that he was before, but the sort of anxiety that shows itself in sudden, small spooks at puddles, or flinching at unexpected noises. As we made our way down the lane, we rounded a corner and found a lady walking two Labradors on the opposite side of the road. They were on leads and heading away from us. Marty clocked them but didn’t break stride. Strangely, he only began to get worried when we had to pull over and wait for a delivery van to pass. When it had done so, the dogs had disappeared round a corner, and I assumed that was the reason for Marty’s sudden alarm. But we had to pull over and wait for cars three more times as we followed the dogs down the road, and each time Marty got quite bothered. He was walking pretty fast and we were catching up them – they had now crossed over to walk on the path on our side of the road – and I was debating about whether to overtake and, if so, whether I should stay on the outside or put myself between Marty and the dogs. Then the Labrador on the outside stopped and looked back at us, and Marty dropped his haunches and rushed backwards so suddenly that he slipped and nearly sat down. This is exactly what he did when he got away from me in the Punchbowl. This time, knowing what to expect, I put the rope against my hip to act as an anchor and murmured, “Heyyy there.” He rushed back until the rope was taut between us, and then he made the momentous decision to release the pressure and came back to me. No rearing, no spinning. I was immensely proud of him. I had only planned to take him as far as end of the road, but I ended up performing a u-turn and taking him back sooner as there was a hidden gateway further up which I knew often had a dog on the other side. I heard it begin to bark at the Labradors, who had gone on ahead of us, and I turned Marty before he reacted. The dogs started having a go at each other and Marty, with his back to them, got a little head-high and dancy; but I brought him down again, led him on to a passing place, and then stood quietly with him while he ate the apple I’d been carrying in my pocket. I could have taken him past the barking dog, which might have helped him overcome his fear when he realised it couldn’t get at him; but it could also have scared him, and given him the idea that walks out are a bad idea. So I felt it best to take him home while we were on a good note.